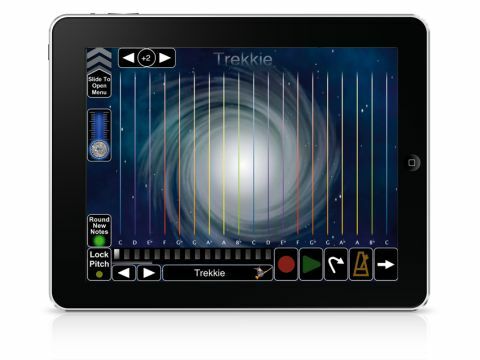 MorphWiz turns your iPad into an expressive and playable electronic instrument. Great fun to play. Easy to understand. A few too many pages. No MIDI over Wi-Fi. Kevin Chartier and keyboardist extraordinaire Jordan Rudess have teamed up to bring us what may be the first serious performance instrument designed specifically for the iPad. Inspired by Lippold Haken's Continuum controller, MorphWiz presents a control system wherein notes of a given (and user-definable) scale are laid out across the screen as vertical lines. As on a traditional keyboard, notes range from low to high as you travel from left to right. However, sounds can morph from one timbre to another as you drag your finger vertically along a given note. You can also play between the notes by placing your finger just between the B and C lines. Additionally, MorphWiz taps the iPad's accelerometer - you can tilt the device to tweak the sound of the built-in synthesiser. On that synthesiser, it's refreshingly direct, with a smattering of parameters that draw upon basic waveshaping, FM and 'Wavesync' synthesis to shape the sounds, with a few effects to spice things up. While FM synthesis is tricky to master, even the greenest neophyte isn't going to get lost with MorphWiz's simple implementation. There's just enough flexibility to personalise the sound, but not enough to distract you from the performance. And that's what MorphWiz is all about: performance. Rudess's experience shows in the design of the instrument and the immediately playable factory patches. MorphWiz provides a built-in recording function with looped overdubbing capabilities. You can adjust the number of beats and measures and there's a metronome to guide you. The results can be exported, emailed or sent to apps that support AudioPaste. MorphWiz turns the iPad into an expressive performance instrument. Is it perfect? No. There are a lot of pages to work through and there's no MIDI-over-Wi-Fi, unfortunately. Even these drawbacks aren't enough to tear us away from it, however.